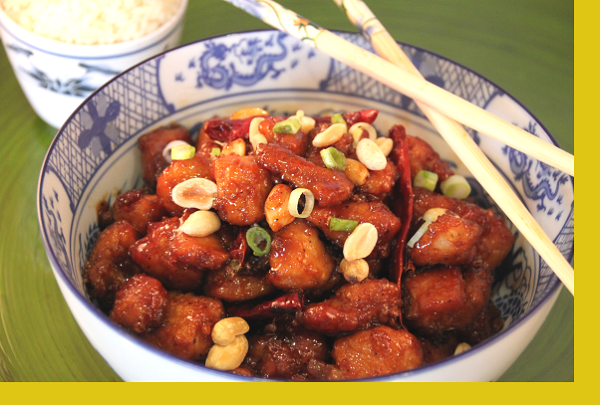 Mildly spiced, slightly Americanized, but otherwise the authentic Chinese restaurant favorite. 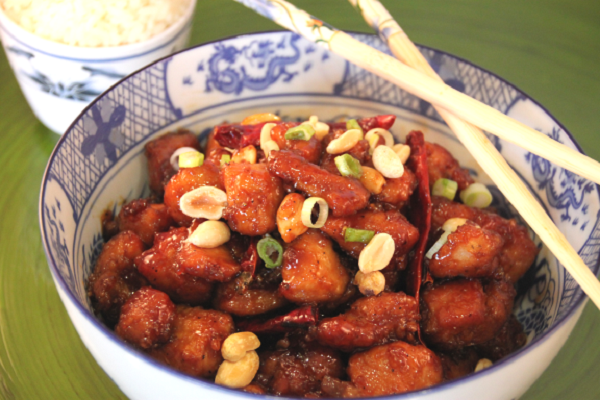 Quick & easy for a week night meal with wonderful, homemade flavors ... served with steamed rice. Note, this dish contains peanuts. 1. Strain and discard marinade 2. In supplied pan mix chicken with corn starch coating evenly 3. Add 5 Tablespoons oil to a skillet and heat on high 4. Add chicken; cook for 7 mins until crispy, cooking in batches if necessary 5. Add chili peppers and peanuts; cook for 30 seconds for mild, 1-2 mins for spicy 5. Add sauce; cook for 3-4 minutes until sauce thickens 6. Microwave rice and serve. I may have messed something up in cooking it but it was super salty to us. Almost too salty to eat, we didn't keep the leftovers. This dish turned out super salty for us - so much so that it was not edible, unfortunately. Maybe we just got a bad batch of the sauce. My mom and dad both commented on how great this was. Mom loved the peanuts and how they added a nice crunch. We really love Maria's Asian food - we always joke that it is better than any takeout we could order! This dish was super flavorful and simple to make. My husband and I loved it! The sauce thickens up so well. A favorite! The smell alone made me so hungry. I'm so enjoying the new dishes.